Moonstone Cottages in Cambria are three individually designed cottages just perfect for a romantic getaway! Nestled between cypress trees, each cottage has stunning ocean views from the most private accommodations on Moonstone Beach. Each cottage closely reflects the coastal influences that appear outside your door. Seascape Cottage a perfect place to enjoy a sunset or watch for marine mammals and pelicans as they travel the coast. This cottage is closest to the ocean with its own oceanfront porch, cherrywood floor with maple accents, a lofted ceiling and Cape Cod style furnishings. Garden Gate Cottage warms you with hickory floors and crown moldings. Embracing the lovely garden surroundings, you will relax to the comforting sounds of the Pacific Ocean. Mariner Cottage is detailed with nautical accents, a classic oak floor with cherrywood accents, and offers unparalleled warmth and comfort. Inside you will find a peaceful sitting area with a great sightline to the ocean in this most secluded cottage. The cottages offer all of the amenities and services you desire to make the most of your stay in Cambria. A picnic breakfast is provided for you to enjoy in your room or take to the beach. 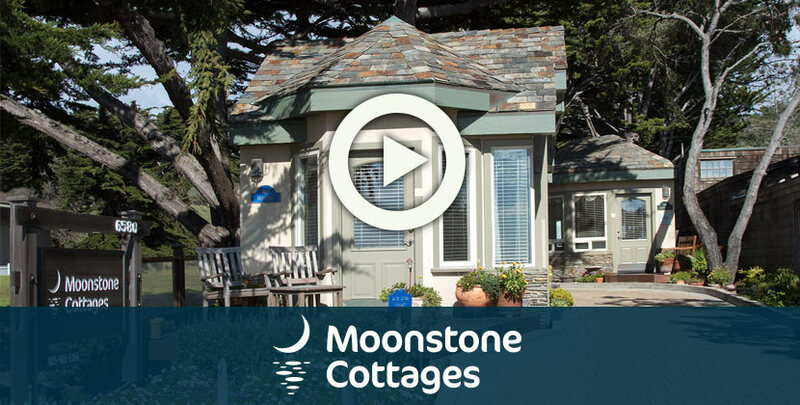 Moonstone Cottages are the perfect Cambria lodging choice for anyone looking to really enjoy their time with no interruptions. The independent units are situated for the ultimate feeling of privacy. Curl up with a book on the front porch, take a leisurely stroll on the boardwalk and snuggle with that special someone by the fireplace in your very own sanctuary. Our specialized services are sure to surpass your expectations. Warm Picnic Breakfast To Go delivered to your cottage at your convenience. Some of the featured selections include our delicious hot puffed pastry sandwich, delicious french toast, or a fruit and yogurt parfait. Enjoy your breakfast in your room or at a nearby seaside setting. Sorry, no pets allowed at Moonstone Cottages.